Make your own Legendary Lion House Rolls from the Lion House Pantry in Salt Lake City, UT. These rolls are perfect for any holiday or get together. Good morning everyone!!! I really missed not posting on Mothers Day, but I made promise to stay off of the computer. I have a few people that have been waiting for me to post this recipe for the Legendary Lion House Rolls, here it is. My weakness is bread and rolls, so when I find a great recipe I tend to stick with it. This recipe is one of the best rolls I have ever put in my mouth. I have been wanting to make these rolls ever since I saw them popping up on several food blogs. These rolls just looked too darn tasty not to make. If you are not familiar with the famous Lion House Restaurant let me give you a little back round. If you live in Utah chances are you have ate at the Lion House Restaurant in Salt Lake City. 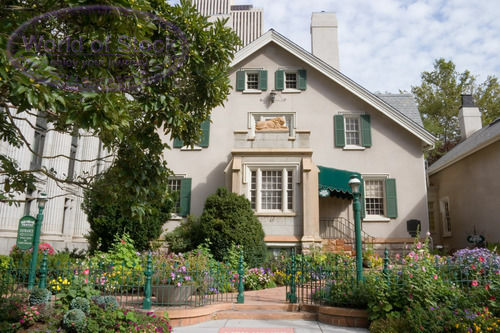 The Lion House was built back in 1856 by Brigham Young. The Lion house gets it's name from the stone statue of the reclining lion over the front entrance. This was once home to Young and his family, but now has been recreated into a restaurant and social center. The restaurant is street level with additional rooms for banquets and receptions. The Lion House Restaurant (photo credit: Lion House Restaurant) is famous for its LEGENDARY ROLLS and home cooked meals. While at the Lion House not only can you enjoy home-style rolls but also breads, pies and desserts made fresh everyday at the Lion House bakery. Chances are I wont get to visit the famous Lion House in Utah but, I can try and recreate some of their wonderful dishes with two of their cookbooks. Lion House Classics and The Lion House Bakery Cookbook. I can definitely see both of these cookbooks quickly becoming a part of my cookbook collection. If you want a little taste of the Lion House then you have to make these rolls. They are so buttery and pillow soft. This recipe makes a huge amount of rolls which makes them perfect for a large dinner or potluck. My family cannot eat that many rolls so I freeze half of them in smaller batches. See my note at the end of this post for directions on how to flash freeze and store your lion house rolls to use at a later time. Below is the recipe and directions for The famous Lion House Rolls. In your mixer combine water and dry milk. Stir until dissolved. Add yeast, sugar, salt, butter, egg and 2 cups flour. Mix on low speed until ingredients are wet, then for 2 minutes on medium speed. At this point I changed over to my hook attachment on my kitchen aid mixer. Add 2 more cups flour, and mix on low speed until ingredients are wet, and 2 minutes on medium speed. Add remaining flour. Once combined, knead with hands, or turn on your kneading function on your bread mixer. Place dough in a oiled bowl. Turn over once so dough is covered with oil. Cover with plastic, and let rise in a warm place until double in size. Place dough on floured surface. Roll out dough, and brush with 1/4 cup melted butter. Cut rolls into desired shape and size (see below and video for cutting and shaping). I have included a helpful video that shows you how to cut and shape the lion house rolls. Click here to view the video. I tried my best to shape the dinner rolls just like she did on the video. When i would spin the rolls the dough just kept stretching on me and getting longer LOL. She made it look so easy but i just couldn't do it. So what i did was place each rectangle on the counter and rolled them up. Place rolls on a greased or parchment paper lined baking pan. If you want to flash freeze some of the rolls to use at a later day this is the point in the recipe you would do so. See my note below on how to flash freeze and store the rolls in the freezer. Or continue with the recipe and let the whole batch rise in warm place until rolls are doubled in size. Bake at 375 degrees for 15 to 20 minutes or until browned. Brush with melted butter while hot. In your mixer combine water and dry milk. Stir until dissolved. Add yeast, sugar, salt, butter, egg and 2 cups flour. Mix on low speed until ingredients are wet, then for 2 minutes on medium speed. Add 2 more cups flour, and mix on low speed until ingredients are wet, and 2 minutes on medium speed. Add remaining flour (I only add one more cup, and leave out the last 1/2). Once combined, knead with hands, or turn on your kneading function on your bread mixer. 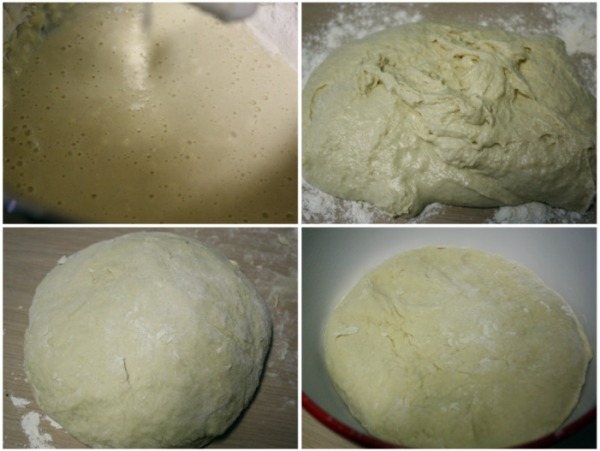 Place dough in a oiled bowl. Turn over once so dough is covered with oil. Cover with plastic, and let rise in a warm place until double in size. Place dough on floured surface. Roll out dough, and brush with (1/4 cup) melted butter. Cut rolls into desired shape and size. Place on a greased or parchment paper lined baking pan. Let rise in warm place until rolls are doubled in size. 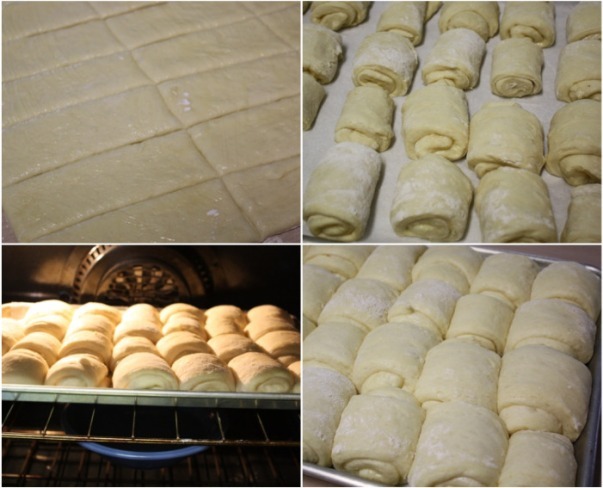 How to freeze rolls: After shaping the rolls place them 2 inches apart on a waxed paper-lined baking sheet. Place the rolls in the freezer and freeze until firm. When the rolls are firm, transfer to a large zip lock freezer bag. Date and freeze for up to 4 weeks. To use freezer rolls: Arrange frozen rolls 2 inches apart on baking sheets coated with nonstick cooking spray or covered with parchment paper. Cover rolls with plastic wrap coated with baking spray. Place in a warm place and let the rolls rise until doubled in size. Bake at 375 degrees for 15-20 minutes or until golden brown. Brush with additional butter while hot. This process will take most of the day, so plan early. Oh my!! I'm sooo drooling right now. Will have to try these soon! I'm a fan of bread and rolls too. Matter of fact our whole family are fans. I'm looking forward to watching your video and giving thise rolls a try. I have that cookbook, my mom sent it to me for my birthday! I haven't tried that recipe, but I have tried the technique, and mine too stretch out when I flip them, lol. Dinner rolls are my fave too. That's some good stuff! Course, I'd want to eat oh, half the pan!! Justs looking at those rolls makes me feel a little weak in the knees. Bread is my weakness too! Those rolls look amazingly good! You did a great job, Tina! I worked at The Lion House for 5 years while I was going to school. Those rolls....to die for. Any of the desserts are also fabulous! Thanks for the chance to link up! LORD..I could quite possibly eat ALL of those! Wow, those look delicious. I ate there years ago for a wedding reception and those rolls are great; especially with the honeybutter. Yum-o! I am definitely going to try these rolls when I have time. They look great! Oh yes ... we'll be trying these soon, Tina! They look fantastic!!! Thanks for sharing,it really looks good! Jane I would be glad to. I am off to check out the link. Thanks. I did make your Applebutter recipe today and will heat it up again tomorrow to can it...Made the Apple Pie Filling and canned 6 quarts (It will be for special guests only. Can't wait until I get moved and maybe have company once in a while to try some of your other recipes. Hi Nancy isnt canning so fun. It takes a bit of work at times but so worth it in the end. You will have plenty of filling for apple pie. The apple butter makes great gifts for the holidays. Your rolls look absolutely delicious! 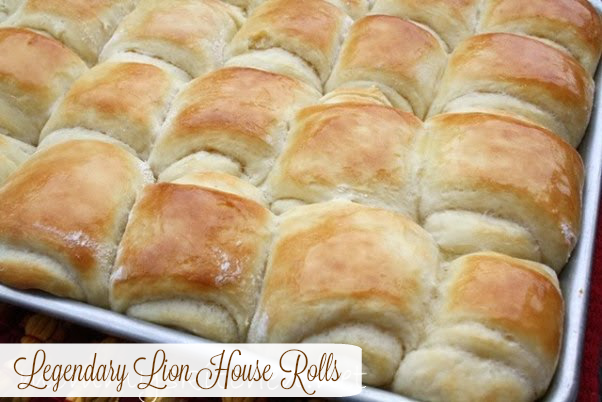 And I have to tell you, growing up in Utah, Lion House rolls are a favorite of mine! They just melt in your mouth. Of course anything from the Lion House is delicious! Great post. mmmm!! Those sound delicious. I'm definitely going to have to try the recipe! WOW!!!!!!!!!! I just made these and had them with lasagna. They are the best I've ever had or made. This recipe will be the permanent dinner roll recipe in my house. My three babies loved them. I did make one alteration I didn't melt the butter that is spread over the dough before they are rolled. I just got the butter really soft and mixed onion salt garlic powder and Parmesan cheese in it before I spread it o the dough. I love these rolls I'll be making more tonight! Your rolls look so dang delicious!!! Can't wait to make them! I am new to this and I LOVE your site. I'm Mormon and makes me happy to know that you have posted the Legendary Lion House Rolls. I really hope you share more good stuff from that cookbook. Again, love your cooking site. Thanks for sharing with us. I am thinking about flash freezing these for Thanksgiving this year. Can you tell me how long they typically take to thaw and rise to double in size? I'm tying to take this time into account so that I can have perfectly warm rolls on the table at the time of our supper. Mmmm...Thanks so much for the help. I've been secretly lurking around your web site for months now and aspire to make as many homemade meals as you do for your family! Happy Holiday's! I love this recipe! I use it to make cinnamon rolls as well. OH MY! I made these last night with dinner. There are only four of us in the house. I had planned to have left overs today, but somehow they were all GONE by morning. Tragic. These are by far my new favorite, and so easy to make too! Thanks. On my gosh! I lived in Salt Lake City and ate at the Lion House many times. The rolls are wonderful! So are their pies and all other entrees, salads, and goodies they serve at the Lion House. Yum! Would love to see some of their pie recipes...any chance? How long do you let them rise? It calls for you to let them rise until doubled in size twice, about how long? I am planning on making these tomorrow and just want to know when I should start them. Thanks! I tried them today to see if this is what I'm making tomorrow. Well, they are delicious and fun to swirl but I made mine a little thicker that i should have and I have Giant rolls. You would only need one per person no matter how big an eater they are. I should have made twice as many with this much dough. And I am using this tomorrow. Made the rolls today and they were a big hit with my grandsons. Thanks for the great recipe! This one is a keeper and easy to make! Made these today for Easter dinner...wasn't sure how they would turn out since I am not one to work with yeast. All I can say is they were absolutely to die for and I can't wait to make them again! I've eaten several times at the Lion House. Scrumpdelitious! Always have the rolls. There is a lady that goes around with a basket full of rolls asking you if you've had rolls. They also have orange butter that goes with them. Amazing! I don't have a mixer but I do have a bread machine. Any ideas on if this could be made on the dough cycle? How long from start to finish, to make these rolls? Would love to try for thanksgiving, but will need to know when to start them to be finished in time for dinner. Thanks! Do you use convection if your oven has that feature? When getting ready to bake the frozen Lion House Rolls, how long does it take them to thaw and rise, before you van bake them? Make your rolls and let them rise until double. Bake at 250° for 30 minutes. They will be done, but not browned. You can leave them out for a couple of days or freeze them for 3 or 4 weeks. Take them out in the morning and let them thaw, then bake at 400° for about 10 minutes - Voila! Brown & Serve Rolls. Parchment paper on top of towel, pat dough out, don't roll with pin. Use paper to roll like a jelly roll cake.... No more stretching. I mixed by hand also. Used herbs in butter. this method would make them very thick and large. Notice the cut version only rolls 3 or 4 times to make the right size rolls.. your method of rolling the whole rolled out dough is way to make the large cinnamon rolls. To roll up the entire rolled out dough would make very large and thick rolls. Rolling up the entire recipe of dough is how you make sweet cinnamon rolls, after adding cinnamon over the butter and maybe some raisons and nuts...then slice in 1 inch sections.. These rolls are way larger than one inch. I don't think rolling up like a cinnamon roll is the way to go. These rolls only overlap 2-3 times and rolling the cinnamon roll way yields too many layers. Best rolls ever! In one of those cookbooks I believe there is a recipe called Green noodle casserole....so good also! Great blog! I just mixed these up and used all the flour, 5 1/2 cups, but the dough sure seems sticky. Hope I did this right. I look forward to baking these up and freezing some for Thanksgiving! Thanks for this recipe, and the link to the instruction for making the rolls. I can't wait for Thanksgiving day to come along so we can enjoy them! Can you make night before and refrigerate dough until ready to roll out? Thanks! Does the 1/3 cup of butter need to be cold or melted or just softened? I got the same result. Hope they are right. How long do you let the dough rise? My husbands found this recipe a do asked me to am make them Thanksgiving. They came out perfect "exactly as I imagined", he said. Thanks for sharing it. We never heard of Lion House before, but we'll definitely be having these again. Thank you so much for sharing this wonderful recipe! I thought I'd give it a try because it sounded promising and looked different than other roll recipes I have tried in the past. I can make bread with no problems at all, but rolls--forget it. They always resemble something you should toss onto an ice hockey rink rather than something to serve with dinner. These were so awesome, though! So easy and-- I can say, considering my experiences,-- foolproof! I was even able to manage the little flippy thing! :) They came out looking exactly like the photo and they were so light and fluffy! Storing this one in my bookmarks for future reference and I am going to go pull my second batch out of the oven now! Thanks again! I don't have dry milk - what can I use as a substitute? Can"White Lily" flour be used? Can a decent portable mixer (with a bread hook) handle the job? Thanks! Wait, do you just add the yeast or is there something special to do with water first? My mother always taught me to put it in warm water with sugar to activate it. Not the case this time? That would be AWESOME! You add the yeast just as directed on the recipe. This recipe is from the Lion House Bakery Cookbook. Thank you, Tina!!! I'm baking them TODAAAAAAAY!!!! Can you put the dough in the fridge like you do pie dough?? I'm making the dough today and want them for Thanksgiving day. Wanted to try to avoid freezing since I want them ready by 1pm. Michahla, I have only made the recipe as written. The only thing I have done different was freeze the rolls after they have been shaped. Sorry I can't be of more help. Easiest and best rolla I've ever made. I live not having to proof the yeast. My 1st try my rectangles were WAY too big, but still made delicious if gigantic rolls. 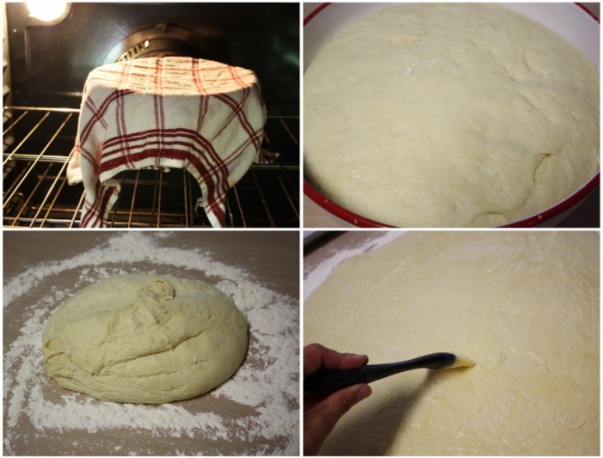 This is the only yeast roll recipe I will usw from now on. Whenever my family has dinner rolls for the holidays, we always have homemade rolls. Through the years, my mom and her sister have settled on a yummy one hour roll, but these look so wonderful. I think I'm ready to break tradition! I'll have to let them try the end results first before I tell them about the recipe. Thank you so much for sharing! Oh my goodness!!!! These were incredibly delicious and incredibly fun to make! I had a blast "throwing" the dough. I didn't have dry milk and didn't want to by it just for this recipe, so I just used milk. I though maybe it was easier for a restaurant to store dry milk in bulk than it was fresh milk. Excellent, excellent recipe, my mom even asked for the recipe. The recipe calls for the butter to be added to the dough - and then to brush with the butter after rolling out. Is this a type-o or do you just use more butter to brush with after adding the initial amount to the dough? Well, I actually made them. I made half rolls and half sticky buns. Yes, you can make cinnamon rolls and sticky buns. Perfect dough for all of these. I'm making them all the time. For cinnamon sugar, suger, brown sugar,an cinnamon, For sticky goo. 1 stick butter, 1 cup bown sugar and alittle pancake syrup. I add sliced almonds on top of mine. You'll love this recipe. Thanks for sharing the recipe. I tried making these rolls today. I followed the recipe as listed though they ended up a bit crispy on the outside and not very soft. The centers taste good but the outside doesn't taste very good. I baked them for 15 minutes. Any pointers?